On Good Friday we set off on our road trip to Lakes Entrance in Victoria. For the last six years we have gone to various locations in Victoria and New South Wales to spend some time with our son and his family. Our two Grand-children have birthdays late April and we take advantage of the New South Wales school holidays (Victorian school children return to school after Easter) for a relatively quiet break together. Our first stop was at Naracoorte and the next day travelled to St Arnaud where we had booked accommodation. We planned a bird-watching and radio day with sufficient time to explore the Park and activate the West of England Fire Tower summit for the SOTA program. This summit is worth two points to the activator and two points for the hunter. On that occasion I took a track off Boundary Road and then a fire track into the Park for about 500 metres. This time we stayed at St Arnaud, about ten kilometres from the Park and we had much more time to explore the Park. We took Centre Road from the end of the Park nearest St Arnaud and drove the track to the turn-off to the West of England Fire Tower track. The final drive to the summit is not a great distance but quite steep for the last few metres and with loose rocks and gravel on the track and some ‘wash-aways’. I think the track would be driveable in a two-wheel drive vehicle with reasonable clearance and careful navigation. I engaged high 4 wheel drive in the Patrol because of the loose stones and some wheel slip. Kara Kara National Park, previously known as St Arnaud Range National Park, ‘contains one of the most intact large areas of Box-ironbark vegetation and landscapes in Victoria’ (Victorian Parks Visitors Guide). These Victorian Government publications are excellent and can be down-loaded and printed before you visit or obtained from local visitors centres. The Guide recommends the Centre Road Nature Drive which is approximately 50 kilometres long and takes in adjoining areas such as the State Forest. We took the shorter drive on Centre Road just before entering the National Park (taking Shed Road and the Border Track to join Centre Road). This photo shows my operating position on the summit with a convenient picnic table in place (JCD photo). Another view of the summit and Park sign (JCD photo). The summit has been cleared of trees to enable views of the surrounding country side for fire spotting purposes and the view are great (JCD photo). Here is my log of stations for the activation. I managed 45 contacts including two park to park qsos. I really enjoyed the activation. Thanks for all who gave me a call and special thanks for those who posted my activation on Parks and Peaks and on Facebook. Kara Kara National Park was accessed via the Sunraysia Highway, Boundary Road and then a track, probably originally a fire break along the side of the Park. We drove into the Park about 500 metres. A convenient tree provide a point for mounting the centre of the dipole and it wasn’t long before I was in business! 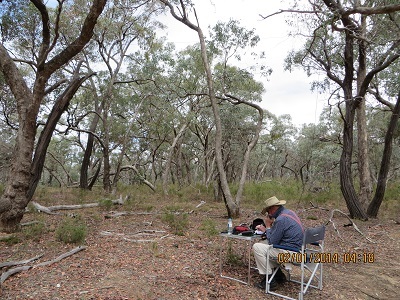 Eleven contacts were had from Kara Kara NP beginning at UTC 04:17: VK5LY, Larry; VK5GJ, Greg; VK3MCD/p, Brian in Mount Kosciuszko National Park on Granite Mountain, VK2 SW 015; VK5AS, Paul; VK3DET, Ernie; VK5JW, Jim; VK3AFW, Ron; VK5FDEC, Damien; VK3XPT/p, Perren portable in Devonport with his FT817; VK3MEG, Steve; VK5MBD, Bill from Red Hill.